Blog dedicated to building a community of Truck Drivers, Logistics Workers and Business Opportunity Seekers where Ideas, Information and Resources abound by John Thomas, freight broker expert. Success! What Does It Take to Succeed? Want to start as a Broker Agent? Intermodal - what exactly is this? Freight Brokers: Do You Need Software? Rita Depp-Tyler on Freight Broker Training: What Is Your Best "Mix"? John at Atex on Attacked by a Wolf !!!??? Joe Rollins on Attacked by a Wolf !!!??? New technology and good incentives have produced some important developments for truckers. Many local trucks and city buses are using if not experimenting with liquid natural gas. This option does not require diesel and/or fossil-based fuels. I understand that LNG for long-distance trucking may not be just around the corner because of several obstacles. Having a sufficient number of stations providing LNG is one problem. There may be other obstacles. Are you knowlegeable about any of this? If so, give us some input here. Make your comment below by clicking on Comments. The terrifying and devasting tsunami and quake that hit primarily Japan has had, and will have, far reaching consequences. In addition to the loss of lives and the fact that the the lives of survivors will never, never be the same, Japan and the world are facing danger from one (or several) nuclear reactors. This is unfortunate because, in my opinion, nuclear development in the USA will be more difficult. We haven't had a nuclear facility since Three Mile Island. And the urgency to get the nuclear progran back on track will only be delayed. Japan has over 50 nuclear reactors that supply about 1/3 of their energy needs. The don't have the natural resources available to create their own energy base. Nuclear is the only way to go for them. China is planning over 30 (if I'm not mistaken) nuclear reactors.They may have natural resources to exploit but I'm not sure they have the infrastructure and technology to bring these resources on board to provide energy for their billions of people. Here is somethng to remember - in my reading about alternative energy sources, I have learned that the safety factor has been mitigated immensely since Three Mile Island. The potential for another disaster has been greatly lowered despite what is going on in Japan. I encourage you to do you own research regarding the issue of nuclear energy. Your kids and grand kids may benefit if you can shed some light on them as to the real potential for nuclear development. There is nothing like impartial and accurate research, learning the real facts and then disposing of any unfounded fears that many people have including those in our highest positions in government. 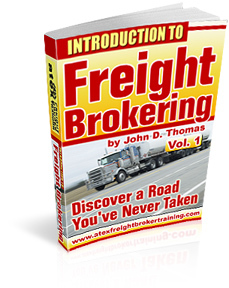 ”Success Strategies to Build Massive Income As a Freight Broker” - $49. Comprehensive Home Study - Get Started for $1,295. Training manual, handouts, videos, limited support. Click Here for More Information & to Order. Atex Freight Broker Training, Inc.